Recent publication of U.S. GDP figures for the 2nd quarter means data is now available for comparison of China and America, the two largest economies, for the first half of this year. A systematic comparison of the two economies' performance shows that China's economy is growing more than three times as fast as the U.S's. 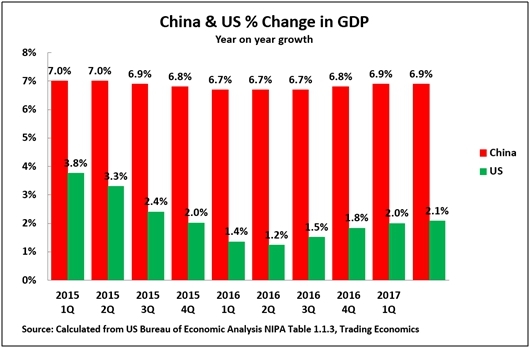 Because, as will be shown below, China's growth has not decelerated significantly, the main issue to clarify in comparing Chinese and American growth is trends in the latter. This article, therefore, analyzes the new U.S. factual data, errors made by Western media and economic institutions in analysis of the U.S. economy. The U.S. GDP growth in the 2nd quarter was 2.1 percent – a very slight increase from 2.0 percent in the 1st quarter. Figure 1 compares this to China's 6.9 percent growth in the same period. Making a comparison of the latest data to the beginning of 2015, it may be seen that China's economy slowed very marginally (7.0 percent to 6.9 percent), while the U.S. economy slowed significantly (3.8 percent to 2.1 percent). Therefore, the claim by Bloomberg and other sections of the Western media that lately the U.S. was undergoing “strong recovery” while China faced the threat of a “hard landing” are the reverse of the truth. Not only was China growing more than three times as fast as the U.S. but China's economy scarcely slowed while the U.S. decelerated substantially. To assess the significance of the latest American data, it is necessary to bear in mind that market economies are inherently cyclical. It is therefore necessary, to avoid exaggerating or underestimating growth, to separate long-term trends from purely short-term cyclical fluctuations. This may be done by taking a sufficiently long-term average that smooths out business cycle fluctuations – the economy will then be seen to show cyclical fluctuations above and below this long-term average. 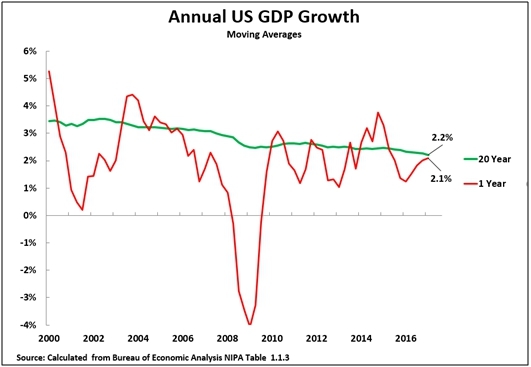 Figure 2 therefore shows the latest U.S. GDP increase of 2.1 percent compared to its 20-year moving annual average of 2.2 percent. A five-year moving average shows an extremely similar annual average 2.1 percent growth. Compared to this long-term average growth, Figure 2 shows that, in 2016, the figure was significantly below its long-term average, indicating a cyclical downturn. In 2017, purely for business cycle reasons, it would be expected that the U.S. economy would grow at or faster than its long-term average in order to compensate for very slow growth in 2016. The slight speeding up of the U.S. economy in the 2nd quarter of 2017, compared to the depressed level in 2016, shows this trend as a normal cyclical movement and not an indication of acceleration of the fundamental American growth rate. President Donald Trump may want to claim credit for some economic recovery, but it's a purely statistical process and not a serious acceleration. To summarize, the latest U.S. data shows a normal process of recovery from very depressed growth levels in 2016, but no acceleration from a U.S. basic long term growth rate of at or slightly above 2 percent. Turning to the test of analysis of the U.S. economy against these facts, it is easy to factually establish that, over a prolonged period, the IMF made systematically over-optimistic projections for the U.S. economy – in technical terms the IMF had an “optimism bias” regarding the U.S. economy. Twice each year, the IMF publishes five-year projections for countries. To compare these forecasts to actual growth, the latest available annual growth data for the U.S. is for 2016. 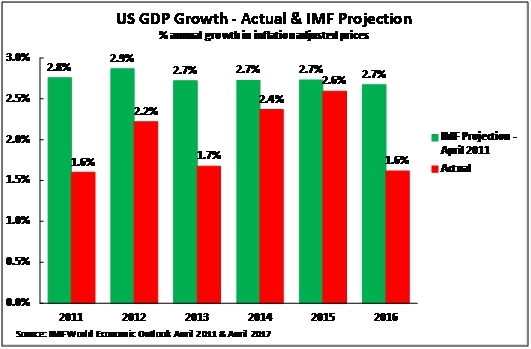 Figure 3 therefore shows the projections made by the IMF in April 2011 – the earliest year in which it made a forecast for 2016 – compared to actual U.S. growth. It may be seen that, for every single year, the IMF predicted higher American growth than actually occurred – the annual exaggeration being up to 1.2 percent. 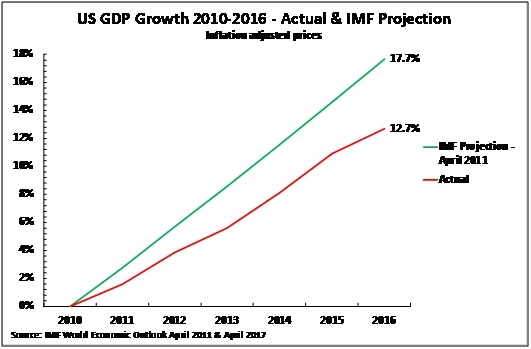 Figure 4 shows the cumulative result of these over-optimistic IMF projections. The IMF projected that in 2010-2016 the U.S. economy would grow by 17.7 percent, whereas actual growth was 12.7 percent. Put in current prices, the U.S. economy in 2016 was $920 billion smaller than the IMF projection. While at least some errors are inevitable, in a well-constructed economic model errors should be random – that is, projected growth should be sometimes above the actual rate and sometimes below. However, if the differences between projection and reality are always in the same direction there is a systematic bias in the model. To be fair, it should be stated that the IMF has recently corrected its estimates by sharply revising downwards projections for U.S. growth. In its latest World Economic Outlook, it projects annual average U.S. growth at 2.0 percent from 2016-2022, approximately in line with current factual trends. However, it's unacceptable that it got it wrong for so long. • There will be a real but relatively limited upturn in the U.S. business cycle in 2017. • This increase will not be large enough to alter the fundamental trend of slow U.S. medium/long-term growth – which will remain at approximately 2 percent or slightly above. • China's economy is continuing to grow more than three times as fast as the U.S's. • In recent times, it was the U.S. economy that slowed significantly, not China's, despite what Western media say. Contrary to some reports in the Western media, China has maintained economic momentum while the US has slowed down.